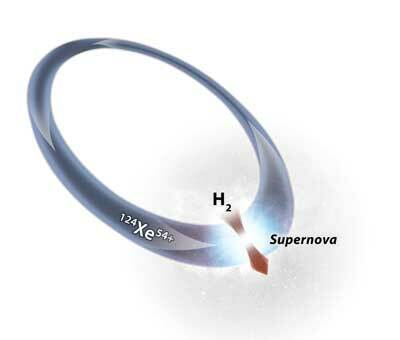 (Nanowerk News) Heavy elements are produced during stellar explosion or on the surfaces of neutron stars through the capture of hydrogen nuclei (protons). This occurs at extremely high temperatures, but at relatively low energies. An international research team headed by Goethe University has now succeeded in investigating the capture of protons at the storage ring of the GSI Helmholtzzentrum für Schwerionenforschung. As the scientists report in the current issue of Physical Review Letters ("Approaching the Gamow window with stored ions: Direct measurement of 124Xe(p,γ) in the ESR storage ring"), their goal was to determine more precisely the probability for a proton capture in astrophysical scenarios. As Dr. Jan Glorius from the GSI atomic physics research department explains, they were faced with two challenges in this endeavour: “The reactions are most probable under astrophysical circumstances in an energy range called the Gamow window. In this range, nuclei tend to be somewhat slow, making them difficult to obtain in the required intensity. René Reifarth, Professor for experimental astrophysics at Goethe University suggested a solution as early as ten years ago: The low energies within the Gamow window range can be reached more precisely when the heavy reaction partner circulates in an accelerator in which it interact with an stationary proton gas. He achieved first successes in September 2015 with a group of Heimholtz early career researchers. Since then, his team has gained excellent support from Professor Yuri Litvinov, who leads the EU-funded research project ASTRUm at GSI.